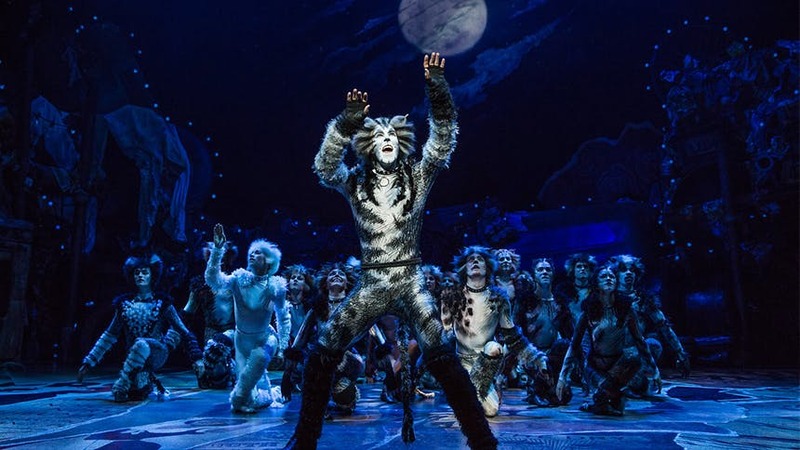 After making his Broadway debut (and then touring the country as Prince Topher) in Rodgers and Hammerstein's Cinderella, Andy Huntington Jones returns to Broadway leading the first-ever revival of Andrew Lloyd Webber's iconic musical Cats. BroadwayBox caught up with the triple-threat star to learn about how Munkustrap is the Rob Stark of Cats, what it's like to transform back into a human post-show, and more. 1. How do you think Munkustrap graduated to being pretty much the leader of the cats? Munkustrap is Old Deuteronomy's son and is next in line for the throne. So his leadership was inevitable, but over the course of the show he learns that true leadership is about understanding and forgiveness, and not just a right of birth. In trying to clarify relationships with everyone onstage, Tyler Hanes and I decided to commit to the idea of Munk and Tugger being half brothers. I am the Rob Stark to Tyler's Jon Snow. Without the Red Wedding. 2. What’s the key to getting out of Cats drag quickly? What’s your post-show process? The drag comes off fairly quickly. It's the post show physical cool down that takes the most time. I spend about 10 minutes getting out of full cat (wig, costume, makeup, three-flight-climb up to my dressing room) and about 15 minutes stretching while scarfing down peanut butter. 3. You’ve starred in R&H; you’re starring in ALW. Now what’s your dream Sondheim role? I have so many super selfish Sondheim dream roles. But I'll go with Franklin Shepard. I loved seeing Colin Donnell's take on the part a few years ago at Encores, and once I brush up on my piano I'd love to take a plink at it. 4. Your show is open and you finally have some time to yourself again now. What’s your next binge-watch? Throwing back to question 1, I am way behind on Game of Thrones. It gets top priority, now. 5. If you could interview anyone, who would you pick and why? I'm terrible at interviewing people, but I'd love to grab a low-stakes drink with Mr. Sondheim. We've met briefly, but an imaginary interview/drink would be a life highlight. Let me know what he says. See Andy Huntington Jones tear up the stage at Broadway's Neil Simon Theatre in 'Cats'.